Description: This book offers details of the voicing of various organ pipes, the tools needed, and details of tuning the instrument. 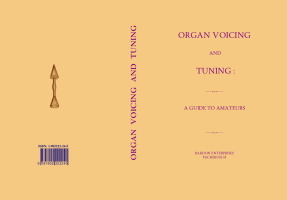 The book has been written for amateur organ constructors and organ technicians. Tools for voicing and tuning. Remarks on materials used for pipes, pressure and pitch. Chamber scales, Principal, Open Diapason, Fifteenth, Twelfth, Mixture, Dulciana, Violin Diapason, Viola di Gamba, Gemshorn, etc. Voicing stopped and flute work, wood and metal. Bourdon, stopped Diapason, Gedact, Lieblich Gedact, Clarabella, Harmonic Flute, Clarionet Flute; Pedal stops, wood and metal. Bourdon (1), Bourdon (2), Violoncello, Fronts, Directions for setting out an 8-ft. rod. The management of Reed Stops, with description. Tuning, bearings or temperament. How, and in what order to tune the various Stops.